The Dragons kicked off their qualifying campaign for Euro 2020 in perfect fashion with an impressive victory. Wales began qualifying for the 2020 European Championships with an excellent 1-0 win against Slovakia. 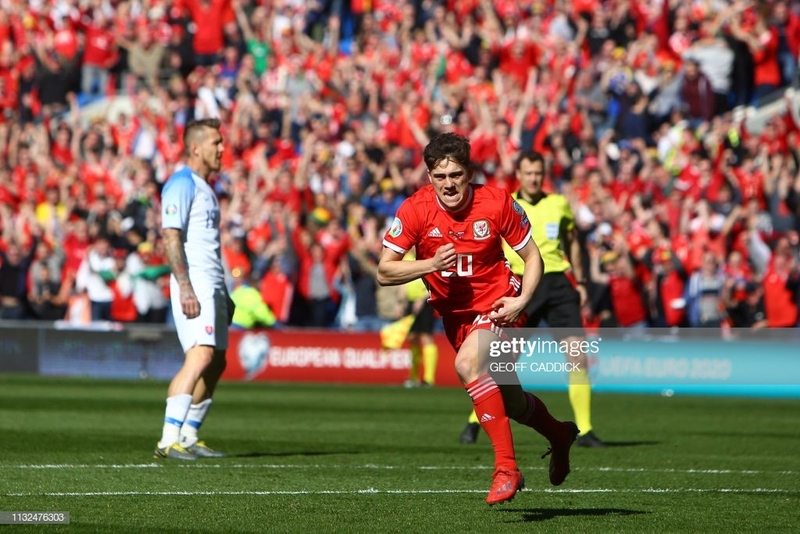 In a balanced encounter, the game was decided just five minutes in when Swansea City winger Daniel James powered home from the edge of the area on his first competitive international start. The hosts should arguably have extended their lead before the break, with Gareth Bale and David Brooks both coming close to scoring, and they were nearly left ruing their missed chances when the visitors applied a significant spell of pressure in the second-half. However, they edged over the line to go joint-top with World Cup finalists Croatia as well as Slovakia in Group E.
Slovakia enjoyed an early spell of possession but failed to create any chances, and the breakthrough came just five minutes in for the hosts. Brooks collected the ball on the wing and slalomed towards a central position but the attack looked to have broken down with a stray pass from the 21-year old. However, James pounced on Peter Pekarík on the edge of the area before slamming home past the outstretched Martin Dúbravka. As the ball nestled in the net, the Cardiff City Stadium erupted under the glorious sunshine. James dashed to the corner flag and saw in front of him a gleeful group of fans buoyantly celebrating the goal. What a moment for the players, their coach, Ryan Giggs, and the nation as a whole. In the 16th minute, Derby County winger Harry Wilson had a free-kick in a wide position. He struck a good arc on the ball as it landed directly in the danger area with the goalkeeper hesitant as to whether to stay or go, but Denis Vavro connected and just about managed to head over his own bar. The hosts played with a vivacious intensity, pressing each and every loose ball and using the blistering pace of their forwards to devastating effect. Star man Gareth Bale picked up the ball on the left flank and darted into the Slovakia box before driving it across goal, but Vavro blocked and the defence were able to clear. Another flowing attacking move saw Joe Allen pass wide to James who fed the overlap of Ben Davies. The Tottenham Hotspur full-back delivered a vicious cross into the centre for Brooks, but his guided effort was on the wrong side of the post. Just after the half-hour mark, Wales looked to instigate a rapid counter-attack through Bale who released James down the flank. The winger managed to flick the ball over the sliding challenge of Vavro but felt the worst of the tackle and won a free-kick. The ball then dropped kindly for Bale, but the 29-year old could only head tamely at Dúbravka. The crowd then came agonisingly close to witnessing an incredible goal from Brooks. The AFC Bournemouth forward nutmegged Dávid Hancko and rolled the ball past Marek Hamšík to open up space for a shot from the edge of the area, and his curling effort was inches wide of the far post. Five minutes before the break, Bale nearly doubled his side's lead by seizing on a mistake from the Slovakian defence. Vavro let the ball run across his own body and the captain pounced but he was put off balance by Milan Škriniar and could only muster a tame effort. The final chance of the half also fell to Bale. FC Twente midfielder Matthew Smith delivered a lofted corner and the Real Madrid forward beat Dúbravka to the ball but glanced his header wide. It had been a truly dominant half of football from the hosts who had stifled their opponents in almost every sector of the pitch, but Slovakia grew into proceedings after the break. First Albert Rusnák was played through one-on-one with Wayne Hennessey, but the Crystal Palace stopper made a vital save. The ball rebounded off Rusnák into the side-netting. Just three minutes later, the visitors continued to push for an equaliser. They patiently probed the Wales box, manoeuvring the ball from side to side, before Hamšík eventually fed Ondrej Duda who unleashed a powerful first-time shot at goal but Hennessey got down well to save. On the hour mark, James — who was a thorn in the visiting defence all afternoon — wriggled away from Pekarík on the left wing before picking out Wilson on the opposite side. His disappointing effort tricked wide of a grateful Slovak goal. With little more than 20 minutes of regulation time remaining, Stanislav Lobotka drove forward from deep and passed to Róbert Mak who cut onto his stronger foot before taking aim at the near post, but Hennessey was equal to the shot. Bale earned his first significant involvement of the second period when he worked his way down the left before unleashing a monstrous cross into the centre. The ball evaded all bodies and eventually fell for Wilson, who shifted it onto his left foot and struck at goal on the half-volley, producing a strong save from Dúbravka. Then, in a frantic two minutes of football, Wales' fragile lead was nearly blown into tatters as Slovakia continued to apply pressure. First, Rusnák escaped down the right and crossed for substitute Michal Duriš who headed powerfully at goal but Hennessey made a terrific reaction save to parry the ball. Hancko had a jab from two yards out but failed to make contact and the goalkeeper, relieved, was able to claim it. Another chance arrived when Hamšík worked into space on the edge of the box and crossed for the bombarding run of Pekarík who could only head into the side-netting. That was however the final opportunity as Wales edged to an impressive victory. These two sides met at the last European Championships in Bordeaux, France — yet just three of the Welsh starters from that encounter featured from the beginning here. A large reason for that is the striking amount of young talent emanating from the youth ranks. Connor Roberts, Wilson and James are all regulars in the English Championship and have so far successfully transferred their undisputed qualities onto the international stage. Meanwhile, centre-back James Lawrence and midfielder Smith turn out in Belgium and Holland respectively and both looked comfortable sporting the famous red jersey, while Chris Mepham and Brooks are on the books of Premier League side Bournemouth. The Welsh outfielders made for an average age of just 23 years, suggesting the future is bright for manager Giggs and his country. While this is true of the home side too, Slovakia were certainly left to rue their lack of ruthlessness in front of goal in a game which they won't have expected to lose. They worked a number of good chances to equalise, particularly in the second-half as numerous players came close to evening the scores. The battle to qualify is now well and truly underway, and knowing that one of Wales, Slovakia or Croatia will have to miss out on a place in the famous tournament makes for an intriguing campaign ahead. This is a considerable blow for Pavel Hapal's side. The Welsh squad now return to their respective clubs before regrouping in June for crunch games against Croatia and Hungary. Slovakia travel to Azerbaijan in the same round of fixtures.